In a Nutshell: The financial services industry once revolved around brick-and-mortar locations, but, thanks to technological advances, many lenders are finding ways to provide better rates to clients by reducing their overhead costs. A good example is Australian firm Reduce Home Loans, which operates out of a single office in Bundall and passes on what it saves in overhead expenses to customers in the form of advantageous rates. And Reduce Home Loans promotes charitable causes near and dear to employees’ hearts — an attractive quality to consumers who prefer to do business with companies making a difference in the world. Through its offerings and fundraising focus, Reduce Home Loans works to promote financial and emotional strength and solidarity among Australians. Early in 2018, Cass received some of the worst news a mother can hear: Her 7-year-old, Lochie, had been diagnosed with Philadelphia Chromosome-positive acute lymphoblastic leukemia — a rare mutation that can cause his white blood cells to become cancerous. The good news is that Lochie’s doctors believe they can cure the disease through chemotherapy. The not-so-good news is that the treatment is expensive, and Cass has reduced her work hours so she can care for her son and the rest of her family during the tumultuous days ahead. Lochie’s case is one of many community charities or fundraising projects Reduce Home Loans, an award-winning Australian lender, has helped raise money for. Each week on its blog posts, the company highlights a cause championed by Reduce Home Loans employees. As a result, the lender not only stands out for the competitive rates it offers prospective homebuyers, but it’s also developed a reputation as a company with a heart. Thanks to the team at Reduce Home Loans and other like-minded donors, Lochie’s Leukemia Fund is nearly two-thirds of the way to its goal of raising $30,000 for his treatments. While this charitable focus is deserving of kudos, the lender is also determined to make home loans more affordable for Aussies. Reduce Home Loans offers consumers the lowest interest rates possible while also providing attentive and hassle-free online service. Customers also enjoy personalized guidance that allows them to select the best loan for their needs. “Since Reduce Home Loans operates fully online from one office, extra costs associated with branches, staffing, transport, and other utilities and overheads are mitigated or completely removed,” said Josh Beitz, Reduce Home Loans’ General Manager. Reduce Home Loans funds its loans through wholesale lenders, allowing it to access competitive, alternative low-cost funding lines through securitization — the process of combining and reselling illiquid assets (in this case, shares of mortgage debts) as commodities. Reduce Home Loans passes these savings on to its customers in the form of low interest rates, which has led to its popularity in the market. And this sort of reach has paid off for countless charitable causes when the company posts articles on its site that shine a light on cases like Lochie’s. Thanks to this rare combination of business success and philanthropy, our team is recognizing Reduce Home Loans with our Editor’s Choice™ Award for helping clients achieve the most affordable home loan rates while maintaining a commitment to its charity fundraising project. Reduce Home Loans features a simplified process that allows consumers to apply online and get pre-approved in less than two minutes. Because the system is fully online, Reduce Home Loans doesn’t need to maintain branch offices in different locations; the entire company operates out of a single space. This more economical model allows the company to keep its costs low. “These savings are therefore passed on to the customers in the form of cheaper rates with the added convenience of online lending,” Beitz said. Take, for example, Reduce Home Loans’ most popular product: the Rate Buster High Lend. At 3.49% APR, it carries one of Australia’s lowest variable rates. The loan features a free, 100% offset account linked to the loan. The balance in this account is factored into the loan’s balance before interest is calculated, creating a lower net balance on the mortgage and thereby reducing payments. The Rate Buster High Lend also has no ongoing fees and makes loan splits available, allowing borrowers to enjoy the benefits of fixed and variable-rate loans. Borrowers are also able to redraw funds — or reborrow money they’ve already paid back on the loan — at no charge. In addition to helping mortgage customers invest in homes, Reduce Home Loans also invests in Australia as a whole by raising the profile of worthy causes. Its fundraising promotions help support struggling families and individuals in dire need. This includes young people, like Lochie, who have been hurt by circumstances beyond their control. By publicizing cases like his, Reduce Home Loans helps to direct life-changing funding to places where it can have a positive impact. The company frequently champions parents and breadwinners who have experienced tragic events and find themselves unable to provide for themselves and their families. One such example is Jake, a father of two who was stricken with meningococcal meningitis and septicemia. He suffered from organ failure, lung collapse, and amputation of both hands and lower legs. Reduce Home Loans has created awareness of a fundraiser for his rehabilitation, living expenses, and raise awareness of the importance of vaccination against life-threatening diseases. 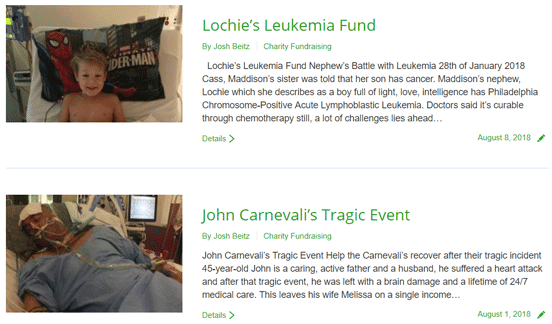 Lochie’s story is one of the many featured on Reduce Home Loans’ charity fundraising page. At other times, the chosen cause just needs a helping hand, as in the case of the Gold Coast Dancers, a nonprofit dance club that has won state and national championships, and has twice traveled to the United States representing Australia at Disney and Universal Studios. Reduce Home Loans’ support has helped these young women improve their club and pursue their dreams as performers. One of Reduce Home Loans favorite charity events is the Anglicare Present Drive that provides holiday gifts to underprivileged children. Navigating a mortgage, especially for first-timers, can be tricky, which is why Reduce Home Loans employees take a hands-on role in ensuring a good experience for clients. This personalized service makes for a better, more consistent experience for customers. Managers can get acquainted with their assigned clients and fully understand their specific situations and goals. The opportunity to familiarize themselves with each borrower’s unique situation enables Personal Finance Managers to help select the home loan best-suited to meet their needs. Reduce Home Loans provides additional financial resources and tools on its website to further assist borrowers. Consumers can find a glossary of mortgage terms, as well as calculators for interest, savings, and income taxes on the site. Reduce Home Loans also maintains a blog with financial news relevant to homebuyers and mortgage holders, helping its clients remain informed on topics that affect them.